Dr. Manu Patel was the AP Physics teacher at TC Williams in my senior year. I've briefly mentioned Dr. Patel in previous posts here and here, but he's always been a supporting character. The time has come for him to get the full day's update that he deserves. I first met Dr. Patel in 1990 when my friend, Daniel Bethancourt, and I (as the two top students in our class) were extricated from the sixth grade for a day to experience a full day of science courses at the local high school. This might have been one of the most idiotic field trip ideas ever, since one of the classes we visited was taking a test, and another had a substitute. The only high points were a class where the students were testing out their toothpick suspension bridges by hanging weights from them, and Dr. Patel's physics class. As soon as we came in, he waved his own class away and told them to "work on something to make you smart", and then took us to the back of his physics classroom to entertain us with all the props from the various physics labs. When he learned that we were from Polk School, he proudly proclaimed that he was one of the original donors back when it was built, and sure enough, his name was prominently displayed on the playground plaque. 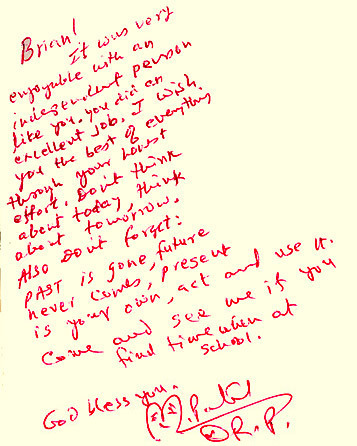 Flashing forward six years in a LOST-esque fashion, Dr. Patel was my teacher for AP Physics B (B was the physics you can see, and C was all the atomic garbage that you can't see). Each class period consisted of a physics lesson mixed with philosophical maxims and peppered with the occasion dismissal of anything irrelevant to physics as "garbage!". Not only was it his goal to bestow his wisdom, it was also his goal to make everyone work towards a 5 of 5 on the AP exam. Just after Christmas time, he broke his leg and the doctor said he'd be out of work for at least two months. Angry at his infirmity, he had all the students come into the faculty lounge for a conference call, where he laid out his game plan for the remainder of the year and warned us that we would end up in the gutter begging for money if we didn't work hard enough at physics. This was followed by weekly physics sessions at his house in Fake Alexandria, where we all sat in a circle around him eager for knowledge. Contrary to the wishes of his doctor, he was back at school in just over a month, burning through the remaining materials for the AP exam as if it were a terminal case. The reward for our 5s was to watch the entire Star Wars trilogy in class instead of learning about atomic physics, which Dr. Patel interrupted only once, to say that Yoda had stolen "There is no try, only do" from him. 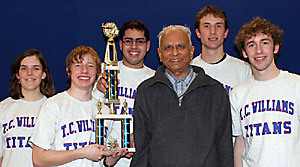 Dr. Patel was also the school coordinator for the Science Bowl, a yearly competition invented so that Thomas Jefferson students could have more trophies mailed to their houses. We held our own, and even beat TJ in one round, but double elimination destroyed us soon after. After a particularly sound beating of a perennially losing school (perhaps it was Woodson? ), Dr. Patel hobbled right up to the TJ team in front of the entire audience and chastised them (and their coach) for their arrogance and unsportsmanlike conduct, something to the effect of "Being smart is not enough! You must work hard and be good people or you will be garbage!" By the time I'd left college five years later, I'd easily taken four full years worth of physics, an almost Kathy-esque amount, and could do linear momentum problems in my sleep. I never did see Dr. Patel again, although I presume that he'll still be teaching out of a wheelchair at the age of 110 and ranting about all the chipmunks.